I, Gloria Poole, of Missouri drew painted signed photographed uploaded all these sketches. Copyrighted. See labels & copyright. 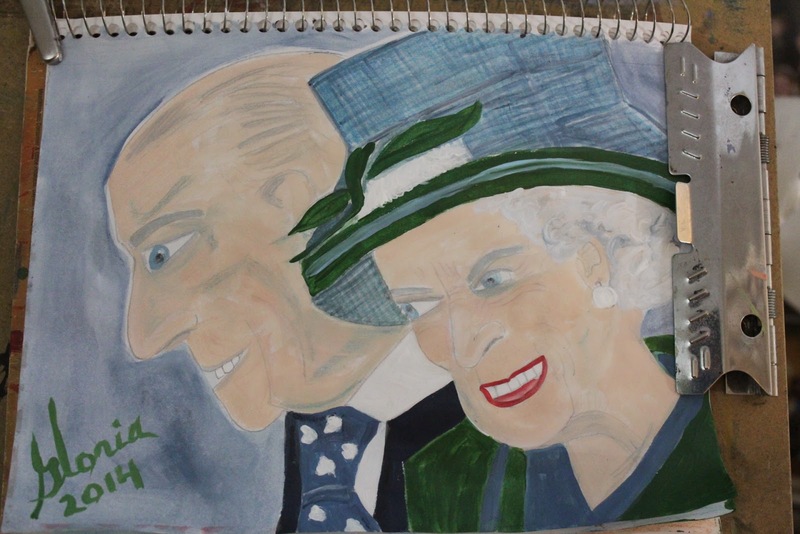 Queen Elizabeth II and her husband the Duke of Edinburgh sketch by Gloria Poole of Missouri, as I saw them in news but I simplified the dress and hat some of the Queen. Completed 26 July 2014 in acrylics on 8 x 11 paper; photographed on my portable sketch board. 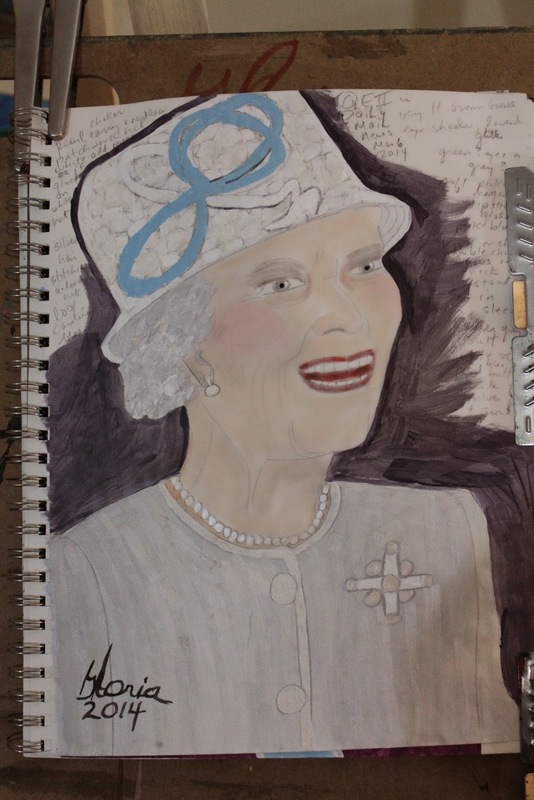 Queen Elizabeth earlier this year sketch from news photo, by Gloria Poole, but I simplified the brooch and hat, and her suit which appeared to be white wool. 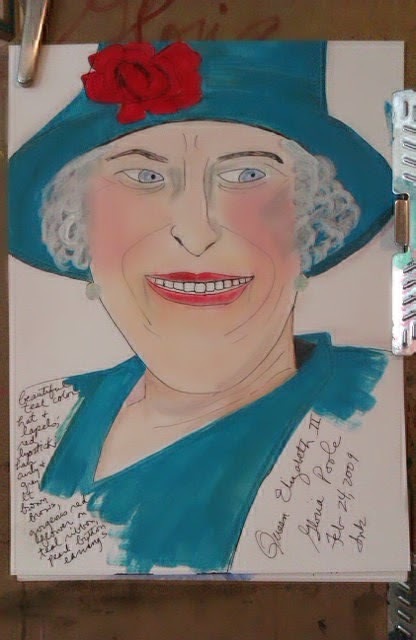 "Queen Elizabeth II , as I saw her in the news in yr 2009; sketch by Gloria Poole, in inks on paper. 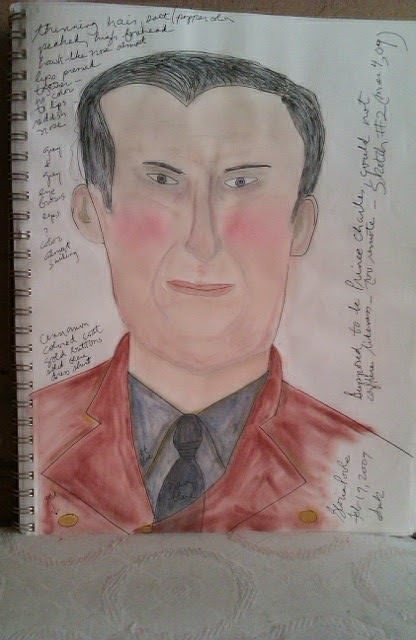 "Prince Charles" sketch by Gloria Poole that is blurred because I enlarged it today after some process at remote tried to shrink it to 1/2 inch in size [as they attempt to hid my signature and description that I wrote in my own handwriting on this sketch. ]I have all of these sketches in tangible form. I drew and painted this when I lived in zip code 80203 for yrs May 2007-Oct 2009, but I moved to Missouri in Oct 2009, with this sketch and all the art I had produced. 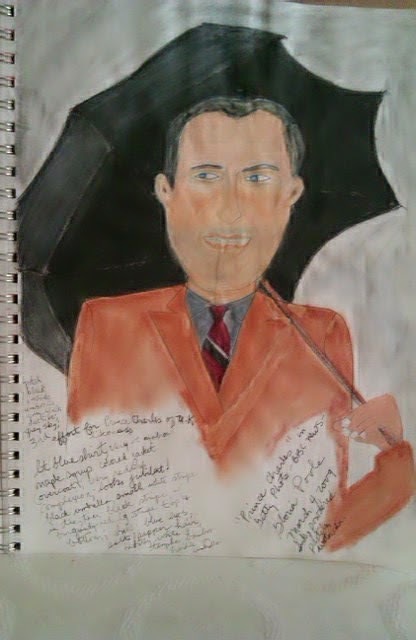 Prince Charles with umbrella, sketch by Gloria Poole in Mar 2009 when I lived in zip code 80203; but I moved to Missouri Oct 31, 2009 with the art I had created . 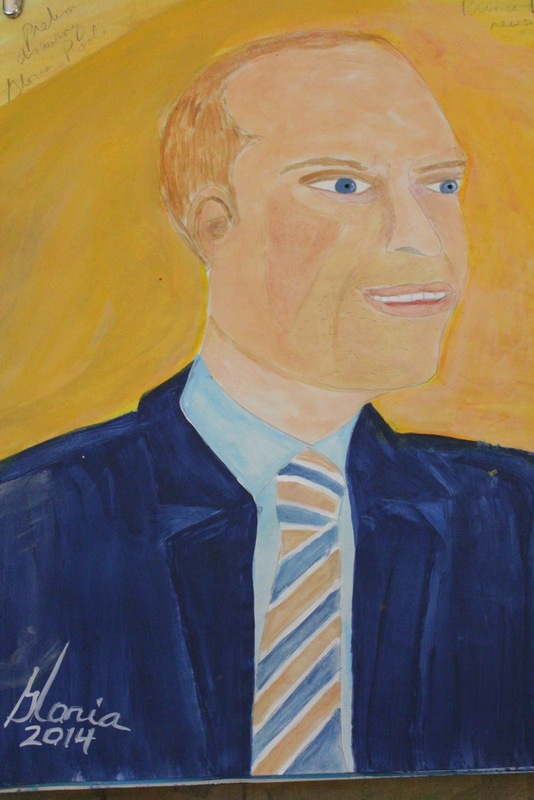 Prince Charles sketch by Gloria Poole, yr 2014, on paper, acrylics. 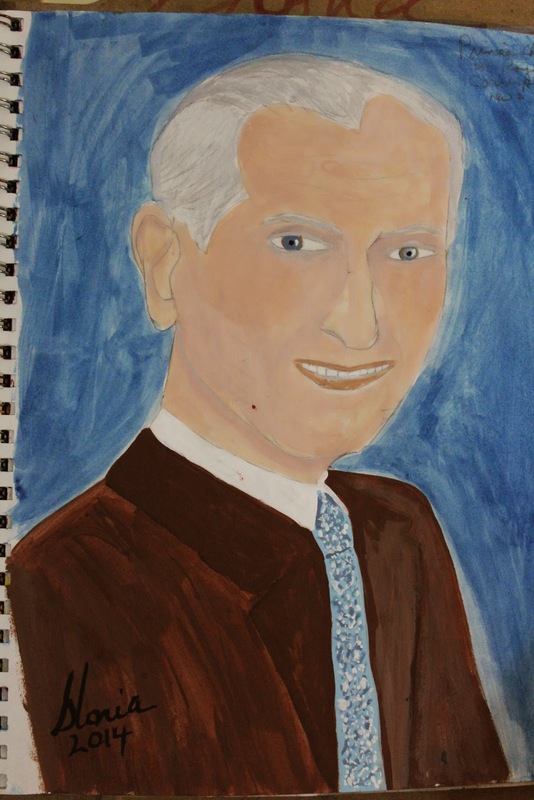 "Prince Charles, sketch by Gloria Poole, in Feb 2009, with my handwritten notes since I was sketching in real time while looking at computer screen; then painted it with inks. 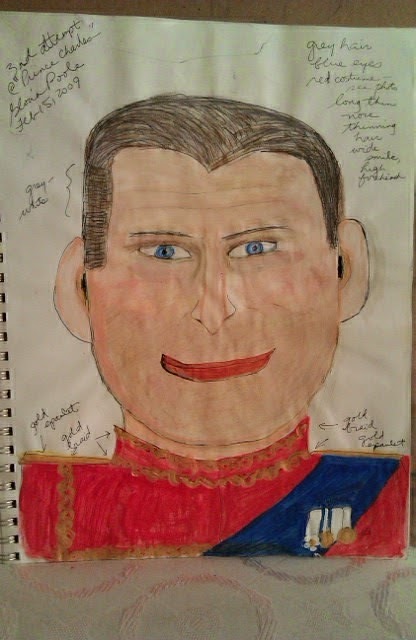 "Prince William sketch by Gloria Poole yr 2014; acrylics on paper; after he was back to royal duties. I admit these are not exact likenesses of these living real people. 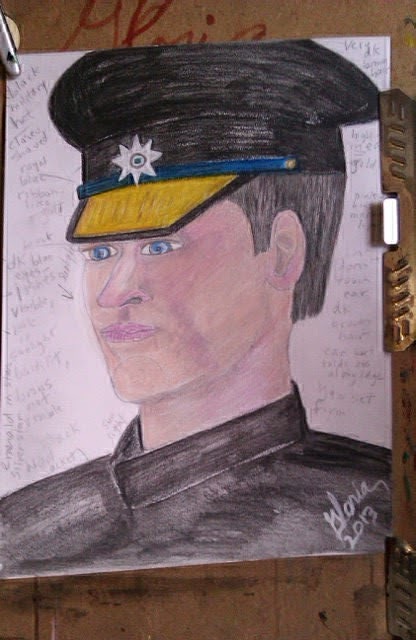 I am ambivalent about attempting to draw, sketch or paint exact likenesses because of the words in the Bible about not making 'graven images" [in Exodus chapter 20, KJV} so I try to achieve a similarity to them only, not a "spitting image" of them. Copyright notice: this blog and all content, all photos, all art and all words belongs exclusively to me Gloria Poole, currently residing in Missouri but born in the state of Georgia in the U S and it may not be transferred to anyone anywhere nor have domains forwarded to it that do not belong to me, nor be reproduced nor saved to disk, nor be printed at remote. I, Gloria Poole, own all rights to this blog and its content and it is covered by U S copyright law as original art photos and words created by me Gloria Poole. For the record: I, Gloria Poole, sign my art I create as Gloria in paint and sometimes as Gloria Poole. Gloria Poole is my real, born with, legal name since I resumed my maiden name including my surname of Poole after both divorces. I, Gloria Poole, am a single again twice divorced white, Southern Baptist Christian, woman and a mother of only 2 grown children who are both daughters and who are Jennifer and Leigh; and an artist in all mediums, a Registered Nurse licensed in Missouri, a poet, author, photographer, illustrator, cartoonist, prolife activist, personhood amendment promoter, republican as defined by U S Constitution, and a blogger, writer. I am not an employee of anyone and draw, sketch, paint, write from my own studio and my own home office in my own private apt in Missouri, for my own purposes. Gloria Poole / Gloria Poole, RN, artist/ gloriapoole / artist-gloriapoole / gloriapoole-paintings / cartooning-by-gloriapoole / photo-by-gloriapoole / gloria0817 / gpoole817 / gloria-poole / gloria.poole / @gloriapoole / @gloria_poole / gloriapoole.RN / gloriapooleRN at yahoo / Ms Gloria Poole / Poole.Gloria ; and other variations of my real, born with name of Gloria Poole, at my own apt in Missouri, 26 July 2014 at 4:39pm.